Statement: Killbox is an online game and interactive installation that critically explores the nature of drone warfare, its complexities and consequences. It is an experience which explores the use of technology to transform and extend political and military power, and the abstraction of killing through virtualisation. Killbox involves audiences in a fictionalized interactive experience in virtual environments based on documented drones strikes in Northern Pakistan. Statement: HR: Human Resource is a 3D fact-finding, point-and-click, hidden object game that plays off in the bureaucratic hellscape that is Parasol Corp. You, a lowly member of the HR department, are tasked with investigating the disappearance of Employee #14182610. Collect enough evidence to compile a report that will satisfy Upper Management. Statement: This installation is a modern take on the Renaissance double portrait, two couples looking at each other in profile. 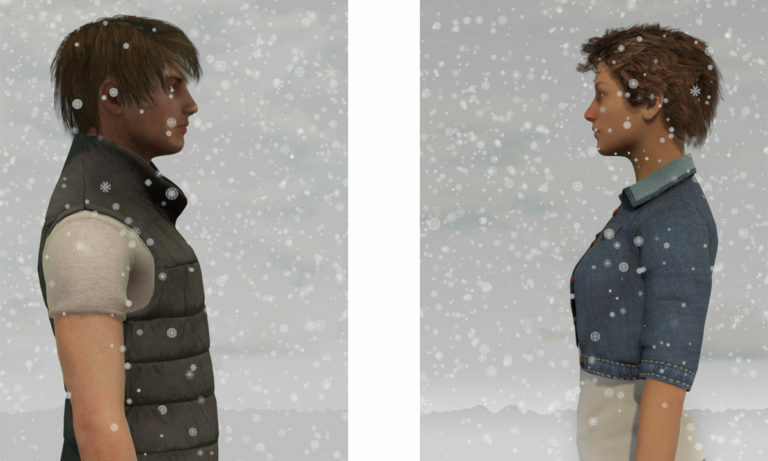 Two large monitors depict a couple looking at each other. The conditions change based on hourly weather conditions and a sensor tracks who is standing in front of the piece. Based on the gender of the visitor looking at the piece, the couple’s respond. The interactivity has been programmed to challenge assumptions about representational art and what it means to be human in a changing physical and cultural landscape. Statement: Play as philosopher and naturalist Henry David Thoreau in his experiment in self-reliant living at Walden Pond. Live off the land, seek out the small wonders and beauties of the woods, and find balance between your need to survive and your desire to find inspiration. Walden, a game is a six hour, open world experience that begins in the summer of 1845 when Thoreau moved to the Pond and built his cabin there. You follow in his footsteps, surviving in the woods by finding food and fuel and maintaining your shelter and clothing. At the same time as you strive to survive off the land, you are encouraged to explore the beauty of the woods and the pond, which hold a promise of a sublime life beyond your basic needs. And, you can interact with characters from Thoreau’s life including mentor Ralph Waldo Emerson, sister Sophia Thoreau, editor Horace Greeley, activist A. Bronson Alcott, naturalist Louis Agassiz among others. The game follows the loose narrative of Thoreau’s first year in the woods, with each season holding its own challenges for survival and possibilities for inspiration. It features the voices of Emile Hirsch (Into the Wild, Milk) as Henry David Thoreau, Jim Cummings (Darkwing Duck, Sonic the Hedgehog) as Ralph Waldo Emerson, Misty Lee (The Last of Us, BioShock Infinite), and Tony Amendola (Stargate SG-1, Once Upon a Time) as Bronson Alcott. Walden, a game has been a labor of love by a very small core team working over the past ten years. It was recently honored as the Game of the Year and Most Significant Impact Game at the Games for Change festival in New York. Statement: Her Story was an attempt to make a videogame without 3D exploration, no meaningful state change and to focus on character and subtext. It reinvents the police procedural as a non-linear piece of Gothic fiction wrapped up in the aesthetic of true crime. It’s a game about listening. Statement: Who is steering the crowd? What if it is heading in the wrong direction? Where does the individual end and the group begin? What is done by choice, and what under duress? An experiment on group dynamics by Michael Frei and Mario von Rickenbach. 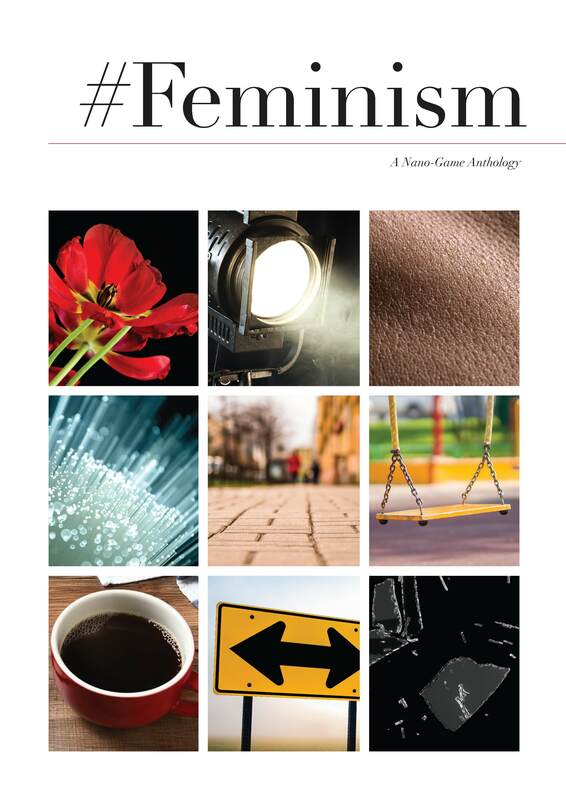 Statement: Looking at the world through a feminist lens reveals absurd, tragic, and fascinating situations. 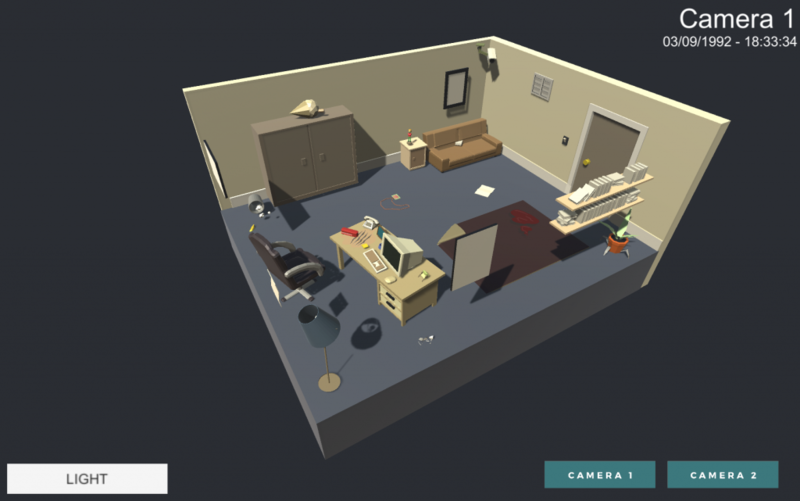 Satement: Replica is an interactive novel game played through a cellphone and social media. You are given a cellphone of an unknown owner. You must look for evidence of terrorism by hacking into the cellphone owner’s account, under governmental coercion. Then inspecting the cellphone usage history and social media activity records. The insane experience of peeping into someone’s private life through a cellphone will transform you into the state’s greatest patriot. 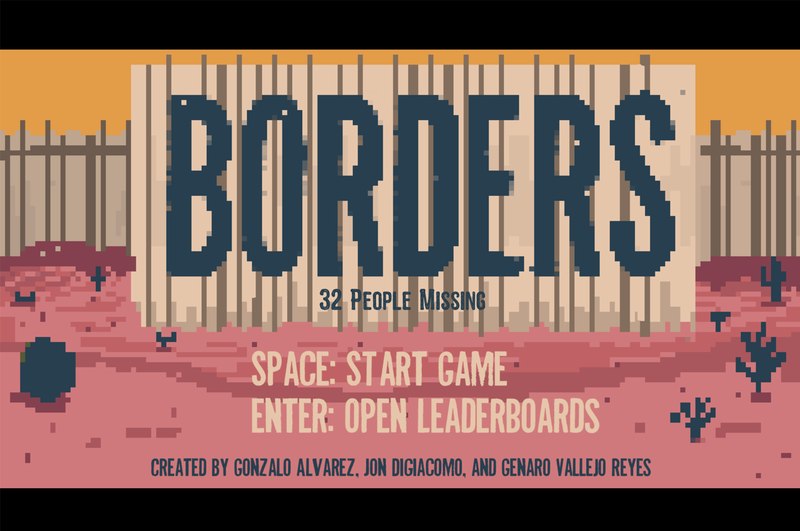 Statement: Borders is a political art game installation created to exhibit video games as an art form and portray the dangers Mexican immigrants face in order to give the next generation a better future. Players attempt to cross the border while avoiding La Migra (border patrol) and staying hydrated.player’s failed attempts are documented via skeletons providing a sense of permanent consequence and symbolizing the lives lost to the Mexican desert. The arcade installation has traveled internationally collecting bodies of players around the world in order to spread the message. Statement: Hyperlinked is an interactive installation that encourages viewers to reflect on our contemporary media environment. The project uses a webcam to map the viewer’s movements onto a dizzying field of found mass media imagery distorted through multiple layers of analog and digital processing. This playful surface is disrupted by a text collage that generates sentences from short fragments of terms of service agreements, advertising transcripts and online personality surveys. The results of these shuffled texts range from the commonplace and banal to jarring and unsettling variations on the often ignored language that shapes our relationship with new media environments. Statement: In February of 2017 we were invited to create a work for a cycle of exhibitions that would help mark the 300th anniversary of the founding of San Antonio, Texas. 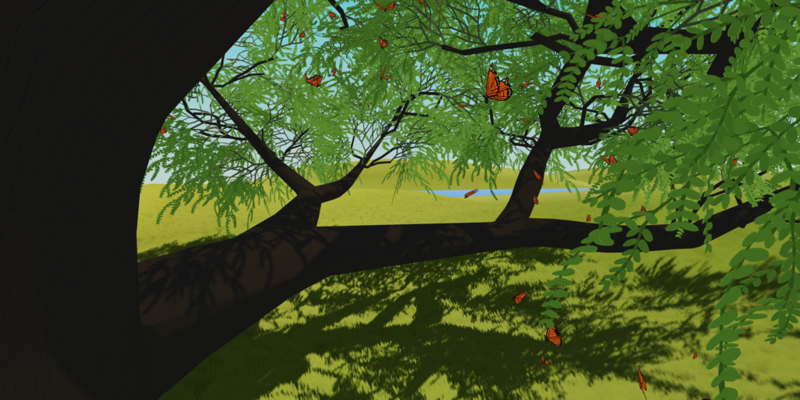 We chose to make a poetic gesture that is set in a pre-human-habitation era of the land, and to represent the migration of monarch butterflies as both a metaphor for contemporary human migrations and as a concrete commentary on our human impact on the ecosystems within which we have lived and hope to continue to do so. With respect to these two migratory patterns, we have often celebrated the migration of the butterflies. Our current political climate has created a pattern where the migration of humans is suppressed. This work employs technologies of surveillance as its interface. The game is watching you.